On my bucket list: this image of acrobats by Mary Ellen Mark, selling for over $10,000 at AIPAD 2016. On a visit yesterday to AIPAD, the Association of International Photography Art Dealers fair at the Park Avenue Armory, my friend, the talented food photographer Evi Abeler, and I played a game: What would you buy if you had $10,000 to spend? After an hour, we decided that actually, $10,000 wasn’t enough: really, we’d need $100,000 to get everything we wanted. This speaks to the way that the photography market has ballooned in recent years. Sometimes, looking at vintage prints—a Stieglitz streetscape that’s selling for $35,000, or an Arbus portrait for $18,000—I wonder how a reproduced silver gelatin image on a piece of paper can command such a price. At the same time, I often find myself marveling at the print as a physical object, at its texture and depth and sheer beauty, and the way it is so superior to any reproduction in a book. In any case, it’s always interesting to take a turn around the booths at AIPAD. Another exercise I give myself at the show is to look for themes and trends. In past years the show has been plenty eclectic, and it was this year too, but as I walked around I did notice a few themes popping up. With such a wealth of material, someone else might have picked up on different patterns entirely, but here is my personal take. Quite a few pieces were presented in the form of grids this year. At times, this was done to emphasize monoculture, as in A Palm Tree Is A Palm Tree Is A Palm Tree (On-Off) by Bruno V. Roels, which gave a series of similar iterations of palm trees. At other times it was to convey exuberance and heterogeneity, as in Portraits of an Era, Polaroid Collage #1 by Christopher Makos, in which denizens of Andy Warhol’s social circle were celebrated in their wild glory. In a variation on this, new work by Paolo Ventura (an artist I’ve interviewed on this site) divided his image into variegated rectangles, perhaps to highlight the fragmentary and subjective nature of seeing. Artists have always been influenced by what came before them, but here I saw some work that was very obviously referring to and updating iconic images. Sometimes the reference took the form of a clear homage, as in Vincent Laforet’s New York 1, shot in 2015, which clearly owed a debt to Berenice Abbott’s iconic Night View, or Lucien Clergue’s 2012 Nu Zebre, which reminded me of Man Ray’s 1923 Torso. Less directly, Cornelia Hediger’s inventive Puppenhaus photocollages reminded me of Grete Stern’s brilliant 1950s series Sueños, which used photocollage as a way of representing women’s inner lives and fantasies. The Sueños series was exhibited in its entirely at last year’s AIPAD, and was, for me, one of the highlights of the show. Vincent Laforet’s New York 1 (detail, left) clearly owed a debt to Berenice Abbott’s iconic Night View (right). A more humorous homage could be found in the work of Eleanor MacNair, an artist who reproduces iconic photographs in Play-Doh. MacNair, a former photo publicist, is an example of the power of social media to create a career. She began making her photo homages for fun, then put them up on a Tumblr that went viral, and now she is exhibiting and selling them as fine art. I like how she chooses a wide range of images by famous and lesser-known photographers, and reuses the Play-Doh, so that the black dress in an Arbus portrait might later become a background in one by Walker Evans. Diane Arbus’s iconic image of identical twins in Roselle, New Jersey (right) reinterpreted in Play-Doh by Eleanor Macnair. This might also be titled, Things That Were Never Meant to Be Sold. From vernacular imagery such as police mugshots to a pitch letter by Diane Arbus, ephemera can now command hefty prices. One booth was selling individual medium format contact sheet frames by Robert Doisneau for $465 a pop (I’ve seen entire contact sheets being sold before, but not individual frames). The lesson here? Save your letters, your contact sheets, your refrigerator notes! One day, your descendants might thank you. In a tangentially related vein, I was amused to see the technology of my youth being celebrated for its aesthetic value, in images of a rotary telephone by Stephen Inggs, and in Nina Katchadourian’s series on books. 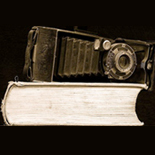 Paper books in particular have become popular subjects for photographers in recent years, from Reinier Gerritsen and Ourit Ben-Haim’s projects in which readers are photographed on the subway, to other fine art photographs of bookshelves. These projects are clearly motivated, at least partially, by nostalgia, but maybe they’re getting ahead of themselves: recent news stories such as this one show that readers are reluctant to give up the tactile experience of holding a real book. Old tech, fetishized: Books by Nina Katchadourian and a rotary phone by Stephen Inggs. Other than the works mentioned above, and the unaffordable prints by the likes of Mary Ellen Mark, Ralph Eugene Meatyard and Lewis Hine that formed part of my fantasy $100,000 purchase, I was struck by some other work at the fair. André Kertesz’s series of Polaroids, which I had never seen before, were showcased in several booths and were perfect little studies of light on glass. There was a new series of color prints by the endlessly inventive artistic duo Kahn + Selesnick, riffing off John Everett Millais’s famous painting of Ophelia, in which models posed half-submerged in water with objects around them. I also liked a series called Under the Black Sun by Peruvian photographer Milagros de la Torre, which highlighted how street photographers in Cuzco apply chemicals to lighten their subjects’ skin tones, and questioned the racial implications of the practice. New work by Kahn + Selesnick (left) and by Milagros de la Torre (right). Finally, I was drawn to images in which photographers used humor. Some of these works featured couples being slightly goofy, from Arthur Rothstein’s captivating Farmer and Wife (an upbeat American Gothic) to images from Inge Morath’s Masquerades series. Others, such as Karen Knorr’s 1970s-80s Belgravia series and Marcia Resnick’s 1970s images of women (a sort of mash-up of Barbara Kruger and Cindy Sherman), used texts to highlight the humor in an image. However it was done, the humor was welcome, since it showed photography can have a lighter side. It brought some merriment to the proceedings, celebrating our idioscyncrasies and the irrepressible human spirit. An interesting fair and post – thank you. This entry was posted on April 18, 2016 by sarahjcoleman in Art Photography, Events, Exhibitions and tagged AIPAD, André Kertesz, Bruno V. Roels, Diane Arbus, Eleanor MacNair, Kahn + Selesnick, Mary Ellen Mark, Milagros de la Torre, Nina Katchadourian, Paolo Ventura, Park Avenue Armory, Ralph Eugene Meatyard, Stephen Inggs, Vincent Laforet.